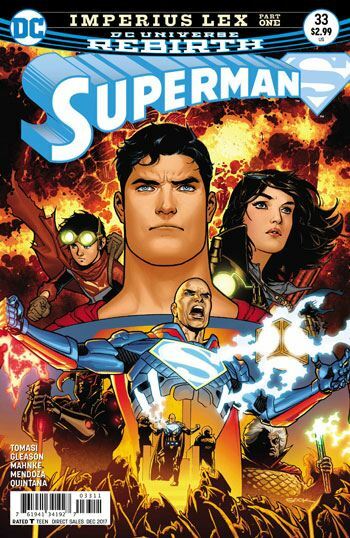 While Superman and Lex Luthor save their city from another crime gang, on Apocalypse, the residents are planning to anoint a new ruler and one of the men of steel from Metropolis may have objections about this. I enjoyed this issue, but it is a perfect example of a padded comic where little happens but will be resolved over several issues in the future. The good things were the interaction between Superman and Luthor. Next, Luthor’s inner monologue about being trusted by the citizens of the city was quite captivating and a good set up for the rest of the storyline. I did find it a deus ex machina that the robots Luthor used to track Superman could not record his identity. Of course, one wonders why they haven’t been used earlier. Doug Mahnke is a god in comics and his work here was very pleasing. He does grit like no one else. While Patrick Gleason learned from him, Mahnke is still the original master. Of course, he was given a comic with larger cinemascope panels where he did not necessarily need to drawn transitions between vignettes. This lack of transition, even in the action scenes make the comic less fluid when reading it.